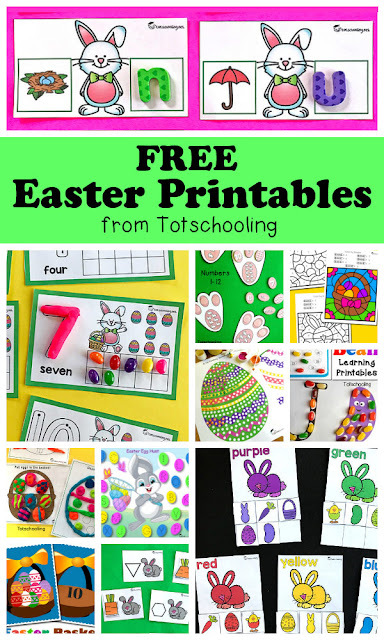 Pre-K and kindergarten kids will love this fun Easter themed sensory bin! 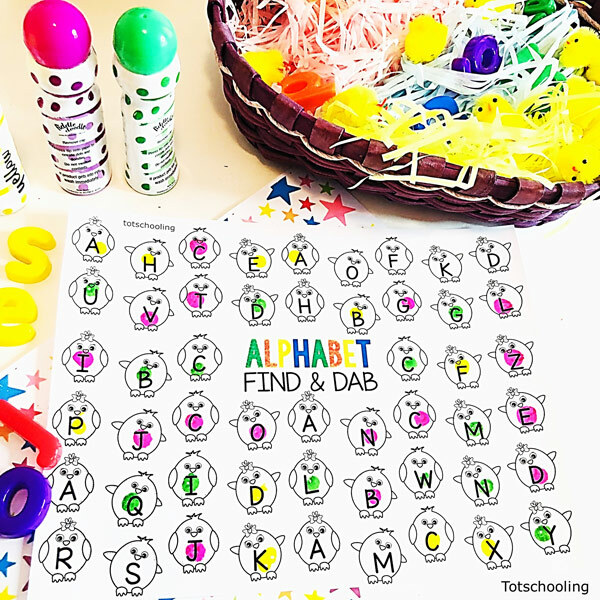 Use magnetic letters with this tub and the kids will LOVE it – they won’t even realize they’re learning. Students will look for the magnetic letters, find them on the mat and dab. 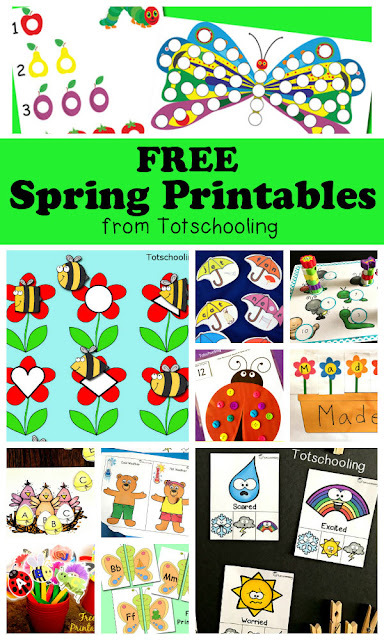 There are two mats included, you could also print and set this up as a file folder learning activity! These mats are so much fun for preschoolers and kindergarten kids alike. You could totally differentiate these alphabet mats depending on the level of the students in your group. Once you’ve printed the mats, place them on the table along with the setup sensory tub, magnetic letters (inside the tub) and some bingo daubers. The kids will look for a magnetic letter and pick one out randomly. They will identify the letter name and then look for it on the mat. There are two versions of the mats (one with lowercase letters and one with uppercase letters). 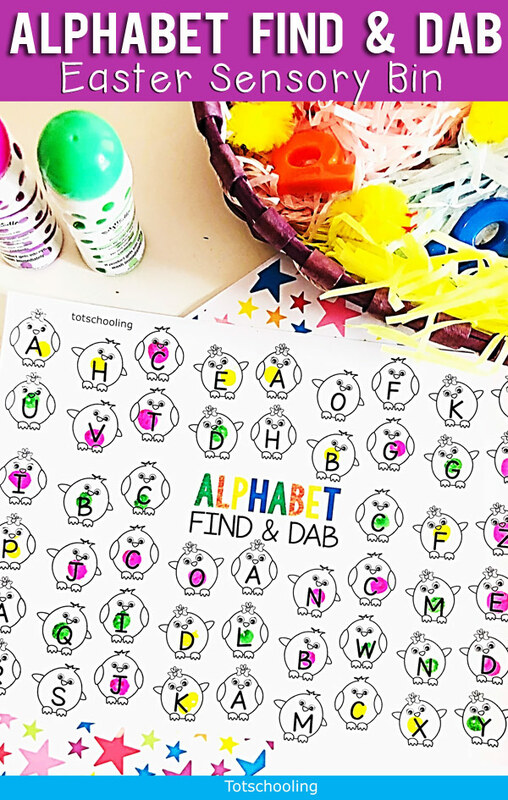 For an easier version of this, have the kids find and match upper-to-uppercase letters and for a more challenging option, have the kids match upper to lowercase letters. You could also choose the letters you are working on and focus on a particular set rather than the whole set at once. The kids will love doing this! If you would like these mats larger, print the mats on A3 poster paper. Founder of Sea of Knowledge, an ESL teacher with a passion for making learning fun and engaging. She loves creating fun activities that children and learners can benefit from. You can also find me on: Facebook and Pinterest.